Her's was an English indie rock band from Liverpool, England, composed of Stephen Fitzpatrick on vocals and guitar and Audun Laading on bass guitar and backing vocals. Their first full-length album was released in August 2018. On 27 March 2019, the duo and their tour manager were killed in a traffic collision while on tour in the United States. Her's are not a group to stand still. Each song they produce, from the lo-fi bedroom pop power of debut track to 'Dorothy' to the duo's equally melodic take on slacker-rock on 'Marcel', sees the Liverpool-based duo shift and float between sounds. Never really fitting into one genre, but somehow nailing whatever they end up doing. The band later released their first full-length album, Invitation to Her's, on Heist or Hit Records on 24 August 2018. Her's were featured on Paste's list titled "The 15 New Liverpool Bands You Need to Know in 2018". An acoustic performance by the band at the 2019 South by Southwest festival in Austin, Texas, US was also featured on BBC Music Introducing. 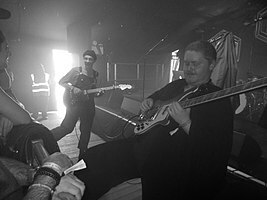 Her's consisted of Stephen Fitzpatrick, who sang vocals and played guitar, and Audun Laading, who played bass guitar and added backing vocals. Fitzpatrick, from Barrow-in-Furness, Cumbria, England, and Laading, from Flekkerøy, Kristiansand, Norway, met at the Liverpool Institute for Performing Arts, from which they both graduated in 2016 after three-year music degrees. Fitzpatrick and Laading previously played in the rhythm section of Brad Stank's band, Sundogs. The duo initially formed Her's in jest, travelling around Liverpool to film comedic music videos and posting them on YouTube. Fitzpatrick was also a drummer but the band used a drum machine with both members contributing to its programming. At around 1 a.m. on 27 March 2019, Fitzpatrick (aged 24), Laading (25) and their tour manager, Trevor Engelbrektson (37, from Minneapolis) were all killed in a head-on road traffic collision and subsequent vehicle fire near Milepost 68 on Interstate 10, close to Centennial, Arizona. They were travelling from Phoenix, Arizona, where they had played on 26 March, to perform a show on the following evening in Santa Ana, California, some 350 miles (560 km) away, as part of a 19-date second tour of North America. The Arizona Department of Public Safety confirmed that Engelbrektson had been driving the band's Ford tour van at the time. The driver of a Nissan pick-up truck involved in the collision was also killed. At the time of the crash the Arizona Department of Public Safety was already responding to reports of a Nissan pick-up truck travelling at speed in the wrong direction going eastbound on the westbound carriageway. ^ Clarke, Stewart; Clarke, Stewart (29 March 2019). "Both Members of British Band Her's, and Their Tour Manager, Die in U.S. Car Crash". variety.com. ^ a b c d Dhillon, Achal (25 September 2017). "New dream-pop duo Her's are well worth listening to". Metro. Retrieved 29 March 2019. ^ "Introducing Her's: Hear debut track 'Dorothy'". Heist or Hit. 7 April 2016. Retrieved 29 March 2019. ^ a b c d e f Steward, Ciaran (23 August 2018). "Her's: "It's crazy; fans know the lyrics and everything"". Dork. Retrieved 29 March 2019. ^ "Her's debut new song, 'I'll Try'". DIY. 10 April 2017. Retrieved 29 March 2019. ^ a b Fitzpatrick, Will (8 May 2017). "Her's – Songs of Her's". The Skinny. Retrieved 29 March 2019. ^ a b Smith, Thomas (10 April 2017). "New Music Of The Day: Her's' I'll Try". NME. Retrieved 29 March 2019. ^ Goggins, Joe. "Her's - Invitation To..." DIY. Retrieved 29 March 2019. ^ "Her's announce debut album 'Invitation To Her's' with new track 'Low Beam'". DIY. 24 May 2018. Retrieved 29 March 2019. ^ Maicki, Salvatore (28 May 2018). "Her's announce debut album, share new single 'Low Beam'". The Fader. Retrieved 29 March 2019. ^ Manno, Lizzie (20 August 2018). "The 15 New Liverpool Bands You Need to Know in 2018". Paste. Retrieved 29 March 2019. ^ a b c "Her's: Liverpool band killed in US crash". BBC News. 29 March 2019. Retrieved 29 March 2019. ^ a b Mackay, Emily (25 August 2018). "Ones to watch: Her's". The Guardian. Retrieved 28 March 2019. ^ a b "Cumbrian musician dies in US crash alongside bandmate". News & Star with The Cumberland News. 29 March 2019. Retrieved 29 March 2019. ^ Torpey, Christopher (29 March 2019). "Her's: Liverpool's indie scene reels at death of 'the loveliest lads'". The Guardian. Retrieved 29 March 2019. ^ a b c Clare, Martin (29 March 2019). "Liverpool Duo Her's Have Died While on Tour". Paste Magazine. Retrieved 29 March 2019. ^ Milton, Jamie (23 June 2017). "No Joke: Her's". DIY. Retrieved 29 March 2019. ^ Daly, Rhian (28 March 2019). "Liverpool band Her's have died while on tour in the US". NME. Retrieved 28 March 2019. ^ Stiernberg, Bonnie (28 March 2019). "Liverpool Band Her's Killed in Car Accident While Touring America". Billboard. Retrieved 28 March 2019. ^ a b c d Loose, Ashley (29 March 2019). "UK music duo was killed in AZ I-10 wrong-way crash, BBC says". KNXV. Retrieved 29 March 2019. ^ a b "Wrong-way crash: Members of British indie duo Her's identified as victims". Parker Pioneer. Retrieved 29 March 2019. ^ "Her's, British indie duo, killed in wrong-way collision in Arizona". www.cbsnews.com. Retrieved 29 March 2019. ^ "British band 'killed by wrong-way driver'". BBC News. 29 March 2019. Retrieved 29 March 2019. ^ Millar, Mark (29 April 2016). "Track of the Day: Her's – "Dorothy"". XS Noize. Retrieved 29 March 2019. ^ Murray, Robin (22 May 2018). "Listen: Her's - 'Love On The Line (Call Now)'". Clash Magazine. Retrieved 29 March 2019. Wikimedia Commons has media related to Her's. This page was last edited on 17 April 2019, at 02:47 (UTC).